GET Advice – Keeping your Silver Jewellery Sparkling throughout Summer. 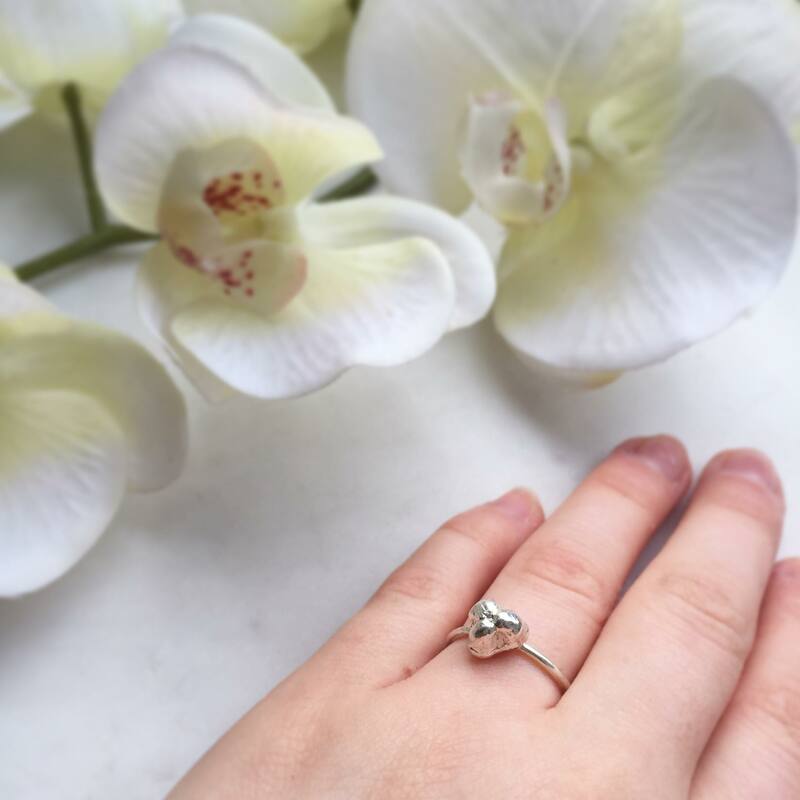 Keeping your silver jewellery sparking throughout Summer can be tricky! Silver is a gorgeous metal but it can be prone to tarnishing – especially during these glorious summer days. Different factors can speed up this discolouration but thankfully it’s easy to get your pieces looking brand new again! So lets get the boring bit out the way. What is tarnish? Tarnish is thin layer of corrosion that forms over certain metals when the surface undergoes a chemical reaction. The silver can start to take on a dull grey or yellow tinge and eventually can go black. Thankfully it doesn’t damage the metal underneath though and, as I mentioned above, it’s easy to remove. What causes tarnish and how do I prevent it? Unfortunately it’s impossible to avoid all causes of tarnish. Sweat, sea water, creams (like suncream), perfumes, air pollution and even tap water can all contribute to the development of tarnish – however there are certain steps you can take to minimise exposure. I would recommend removing your jewellery before showering and applying any creams, deodorants etc. While at the beach you might be best to take your jewellery off and keep it in a zip lock bag in your purse. Suncreams can leave a film over your pieces and the sand is likely to buff away the polished surface. Please don’t think I’m recommending skipping the suncream though to save your jewellery – safety first! When not wearing your jewellery storing it in an air-tight container or zip locked bag is the best way to keep it clean and shiny. I know this maybe seems like overkill (and your friends might give you funny looks when they come to visit) but trust me it works! Alternatively a jewellery box can help too. I specially select the boxes I sell my work in so they don’t cause tarnish but that’s not the case for all boxes; some are designed purely for short-term display so it’s worth checking with the maker if it’s okay to use the box for storage. You can also buy anti-tarnish pads pretty cheaply you can leave inside your jewellery box for extra protection if you like. Help! It’s already tarnished. What do I do? Don’t fret! There are a few ways to get your pieces looking good as new again. Polishing cloths are a quick and easy way to remove mild tarnish. I recommend a Town Talk Polishing Cloth – simply wipe over the surface of your pieces to bring the shine back! If the cloth wont quite cut it there are other products or methods you can use. I was looking into ways of cleaning jewellery without the use of harsh chemicals and found you can remove tarnish with just baking soda & tin foil. I tried out a few ‘recipes’ I saw online (some people suggest adding more steps) but the simplest method worked the best for me. It’s a more eco-friendly option than the stuff you would buy in a shop and is gentle on the work. Aluminium baking dish (aka excuse for a takeaway) or a tempered Glass bowl & Aluminium foil. 1. 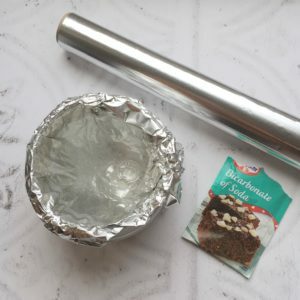 Add your Bicarbonate of Soda into the aluminium dish or line the bowl with aluminium foil – shiny side up. 3. 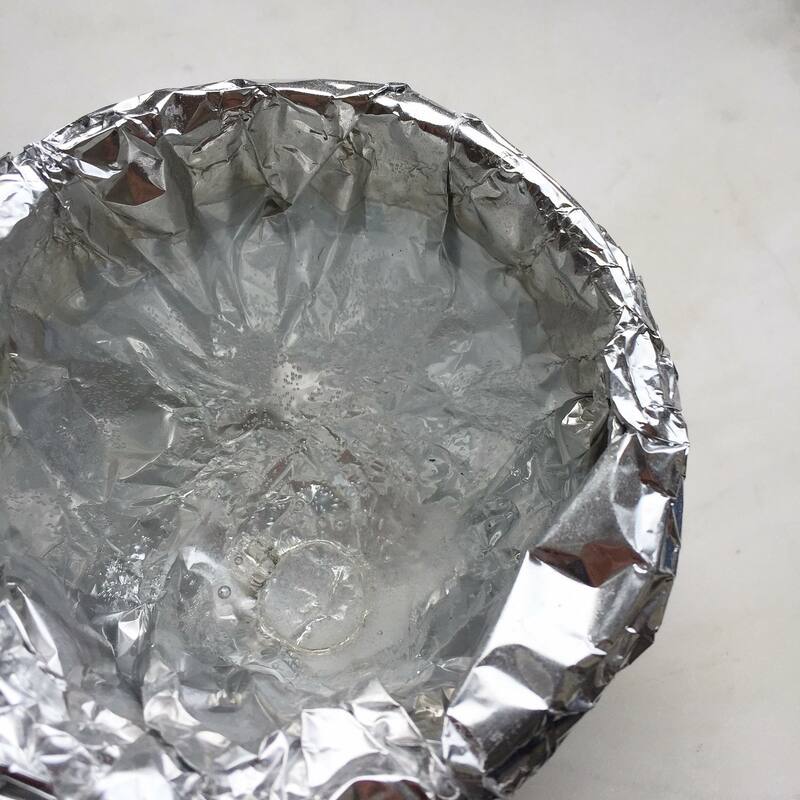 Use tongs to remove the silver pieces, rinse under a tap using washing up liquid and a soft toothbrush. You can give then give them an extra buff with your polishing cloth if you like. And voila! 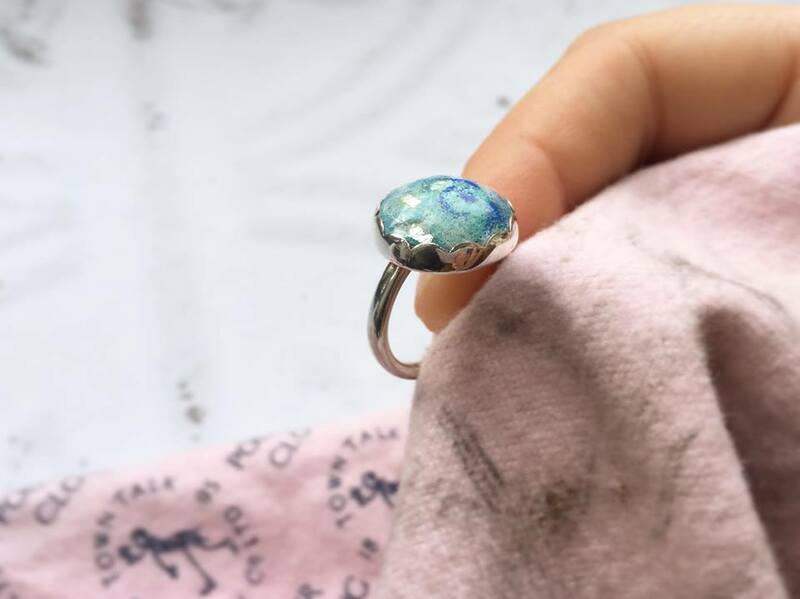 My ring by fellow GET member Jane Harrison Jewellery was good as new! Another option is a silver dip which may be a better option for more heavily tarnished pieces. I have used Town Talk again (promise this isn’t a secret advert for them it’s just a brand I have happened to use and I know works well). Simply dip your jewellery using the basket and submerge for 30 seconds – 2 mins. Although it doesn’t mention this in the instructions I would recommend running your piece under a tap and scrubbing it with a soft toothbrush (a kids one works well) & washing up liquid after removing it from the dip. It is important to remove all traces of the dip from the surface of your jewellery as it can cause more extreme tarnish to occur after. You should also always wear gloves and clean your jewellery in a well ventilated area when using silver dips as they are pretty poisonous! Don’t use Dips if your piece is not just silver as they are chemicals and can damage porous or dyed stones, pearls and enamel. 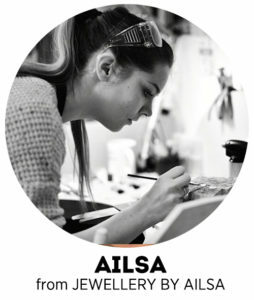 If you aren’t sure of the best way to clean your jewellery or have a piece that needs a little extra TLC just ask a jeweller! Thanks for reading and I hope you found this useful. If you have any questions feel free to email me at awrjewellery@gmail.com.